The Other Boufs: Mommy, Daddy, Katie, Timmy ... and more! 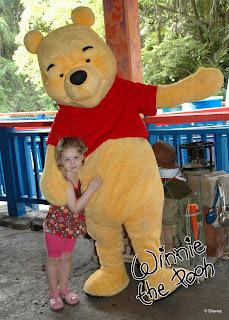 : Way Back and WORDFUL Wednesday - Disney Vacation (Day 4) - A LONG (but fun) Day! 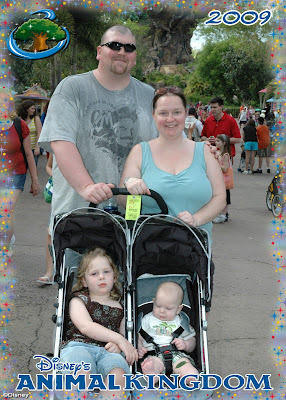 Way Back and WORDFUL Wednesday - Disney Vacation (Day 4) - A LONG (but fun) Day! Since our vacation was OVER a month ago and I'm STILL wrapping up blogging about it, I definately think it qualifies for Twinfatuation's Way-Back Wednesday and well, it DEFINATELY qualifies for WORDFUL Wednesday over at 7 Clown Circus. Check out their great blogs to see who else is playing along or to join in yourself. On Friday of our vacation we went to Animal Kingdom for the entire day and then directly to the Polynesian resort to have dinner at Ohana (our favorite!!). I think we got to the park about 9:15am. We split from the boys right away so Chris could go get us fast passes for the Safari in Africa. Katie and I went towards Dinoland. 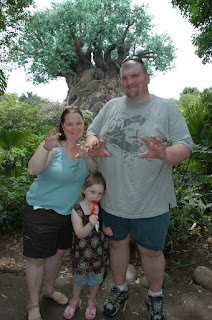 First we stopped to get our picture taken in front of the Tree of Life. I am normally go, go, go with no stops until we get to our first rides but I learned to be a lot more mellow on this trip. For one, I had to be traveling with a 6 month old and second, it really wasn't that crowded. 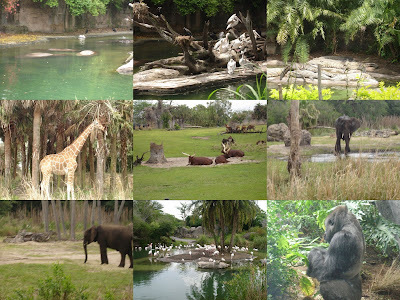 Although, Animal Kingdom, later in the day, turned out to be the most crowded day of all. We didn't have to wait for any rides, but the walkways were really crowded and there just seemed to be a lot of rude people out this day. At one point, I was trying to get out of the restroom and this big group was standing right in front so noone could get in or out. I stood there saying excuse me for a few minutes and eventually pushed my way through. I told them that I'm not sure you realize it, but you are all blocking the only way in and out of the rest room. What was the ringleaders response? Shut uuup! Them are fighting words! I went over to Chris FUMING and he just laughed at me. 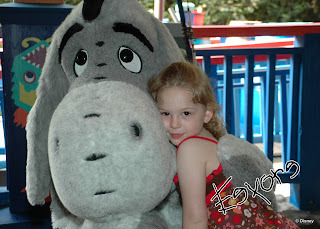 So back to a carefree morning....on our way to Dinoland I saw that Pooh and Eeyore were out to take pictures and Katie was eager to see them so we took a little trip to see them first. A word on Katie's outfit. I actually dressed her in this with the expectation that she would go on the Kali River Rapids and get soaked and then get changed before breakfast. I was utterly amazed that even when she didn't go on that ride before breakfast she still cooperated and changed her clothes for me before breakfast (because I'm neurotic like that). What a good cuddler Eeyore is! Then we continued on to Dinoland and went out the Triceratop Spin (similar to the Dumbo ride, but with Dinosaurs). We took some pictures of ourself by holding the camera out and Katie thought that was hysterical, so we have many of this pose...some even taken by Katie. While we were in the air, we noticed Chris and Timmy were there to meet us, but because there is never a line for this ride first thing in the morning we went on one more time. Then we headed over to Dinosaur! Katie was tall enough last year, but we figured it was too scary for her. This time I thought she could handle it, and she did, BUT it was even more scary than I remembered and I kept covering her eyes every time I thought the really scary T-Rex was about to jump down on us so she didn't get scared. I think she'll probably skip it next time around. After some potty breaks, it was close to our 10:20 breakfast time so instead of riding the rapids, we cut through to Asia and got fast passes for me and Chris to ride Expedition Everest later on. We then moved on back to Africa to check in for our Donald breakfast at Tusker House. Donald, Daisy, Mickey and Goofy are at this one, but it's considered a "Donald" breakfast because it's the only character meal that he's at. We had been to this breafast for the first time last year and loved it and since we usually spend an entire day at Animal Kingdom - it's a nice late morning break to sit down here to eat. I haven't mentioned this before, but when possible we usually try to get the latest breafast reservation possible. We'll eat actual breakfast at our hotel (we bring all kinds of breakfast bars and mini cereal boxes with us) and then treat this as our lunch (usually followed by an early dinner). Hey, you..with the big nose and ears...look at ME!!! Daddy, it's time to go...here - I'll help you finish your drink. Let's go! Let's go! I didn't snap too many pictures since I have them from past vacations, but I had to get the crocodiles (top right) since their Katie's favorite and the others were just really cool and close to us. The chimp was from the walking trails after the actual safari ride. Katie: Um OR, I'll just continue to make a mess with my popsicle, instead. We skipped the INCREDIBLE Finding Nemo and Lion King shows this trip since we've seen them multiple time before. (If you are going for the first time, you should REALLY try to fit those shows in). We did decide to give the bird show a try since we had never seen it before. It was cute and both kids liked it, but it went on and on with no end in site...so after we enjoyed it for about 20-30 min, we ducked out. After the show we got our fast passes for the Kali River Rapids and then headed over to Expedition Everest. I got into my fight I told you about earlier and then Chris went on the ride while I nursed Timmy and me and the kids hung out on a shaded bench. He was back in no time at all and then I got to ride and I had him bring the kids over to the Dig Site playground back in Dinoland. It's funny, this trip it seemed that the rides I remembered being boring were more fun than I remember and those that I really looked forward to didn't live up to my expectations from last time. I had been on Everest in December 2006, when I considered it to be THE best Disney roller coaster. I couldn't go on last year because I was pregnant, so I was really excited this time and I even wound up in the very first cart. It was loads of fun, but I do think the Aerosmith Rocking Roller Coaster at Hollywood Studios is better. I met up with Chris and the kids at the playground. One of the Disney photographers, who are usually only with characters or at the main picture points (like the Tree of Life), was in snapping pictures of the kids playing. The second she saw Timmy she just plopped on the ground in front of him and started snapping away because he was being so cute and silly. 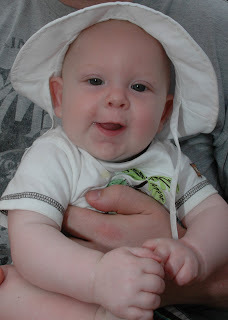 Full belly, sitting on Daddy's lap, piggies in my hand, in the shade on a beautiful day...WHAT could be better? And then when she was done, she just stayed and played with him, trying to get him to give a great big smile for me to capture with MY camera. Ha, ha..oh yea, a silly lady playing with me and making silly faces is even better. It then proceeded to take us 1 and a HALF hours to get to the Polynesian!!!! I think we were at the bus stop by about 4:15, we figured we were in luck, we JUST caught a bus that was about to leave...that's where our luck ended. I guess close behind us were a group of guests with wheelchairs. It takes a long time to get them on the bus. But at least when you get to the stops, you don't usually have to wait again, BUT apparently the Animal Kingdom busses all ALSO stop at Typhoon Lagoon AND all the busses going to the Polynesian ALSO stop first at the Contemporary...where all of the guests with wheelchairs were unloaded. The drivers are actually pretty quick about buckling them on and off the buses, but the buses have a hydraulic lift to lower the steps for the wheelchairs and it is SOOOO slow!! I was then basically hyperventilating (and I'm not even exaggerating) because it's approaching 5:45 and our reservation was at 5:05. This is a popular restaurant and I was so afraid that they wouldn't even sit us without a huge wait AND we were all disgusting and dirty and had no time to wash up and change. But as I checked in, in a wild panic, I was reminded that I was in Disneyworld. I was told that since we were so past our reservation that would make us NEXT...was that good for us? I mentioned that I would love an opportunity to clean up first and I was told sure, would 15 minutes be good for you? Ah, PERFECT?!?! So, we cleaned up, changed (me and the kids, anyway), and got called exactly 15 minutes later. (I should add,though, that not only do we love the food at Ohana, but it has continually-and this was our third time there - had the best service of all the Disney restaurants for us...the people there are just EXTRA friendly and helpful. 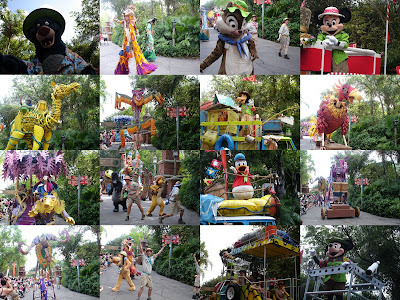 It is so much fun for the kids, with parades and games every 20-30 minutes. Part of the parade around the room. Playing with moraccas and doing the limbo (and later on she got to push a coconut around the room with a broom). The food at Ohana is all you can eat family style. It starts out with salad, asian noodles, honey barbeque chicken wings, steamed brocolli, and dumplings and then the meat is served table to table off of long skewers...shrimp, turkey, steak, and pork...cooked over a wood-burning fire. I love this place, mom! Arghh, and so do I! the MAGIC KINGDOM and breakfast at Chef Mickey's for Day 5!!!! I'm in California, so we get to Disneyland quite a bit. But Disneyworld is always a special treat for us when we get to go. Lots of great pictures. Looks like you all had a wonderful time. Thanks for following. I'll be doing the same! Wow!! Disney is just one big fiesta for the kids. The safari ride looks beautiful. And your kids are so adorable. Now I want to take the kids to see Disney. They would love it! I am going to talk to Jonathan about making it a trip in the future. I didn't know it was so beautiful. I can't believe you went on the same cruise as us. That is so cool! We were on the Royal Carribean too. When we went to Cayman Islands the guy driving the charter boat back to the ship just about killed us. The swells in the water were getting really high and he ran the charter boat into the ship. It's scared the crap out of everyone. Even the captain of the ship was out there and he was looking a little frantic. I would love to see your pics from your honeymoon. Have a great week and Happy WWW! 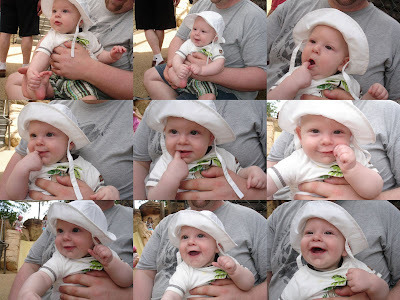 What a wonderful, wonderful story of a vacation and series of pictures...makes me want to go! Thanks for playing along with Way Back When-esday! Darling pictures! Disney is outstanding!! All your pictures were wonderful. You must have a great camera. When your kids are older, go to Orlando Studios. All the rides have fire or water which is too much for little ones. Wow, you had a wonderful vacation to Disney World. Definitely is magic place. Great pictures. Visiting your blog from Twinfatuation. Carissa-:( Unfortunately, my honeymoon pics are a sad story to tell...my computer crashed and I lost a few months worth of pics including ALL of my honeymoon pics. I had great ones, too! You guys did SOOOOO much! WOW!